Crop rotation or growing different crops in one cropping season deters the most important carrot pest, the carrot root fly (CRF). This practice increases the numbers of its natural enemies due to the increase in suitable habitats (Muehleisen, et al., 2003). Crop rotation, in particular prevents CRF population build-up. Onion and garlic are commonly used as companion crops and barrier crops to confuse the carrot fly by masking the scent of carrots with onion/garlic smells. Inter-planting onions and carrots - four rows of onions to one of carrots is sometimes recommended (HDRA, 2003). Intercropping Medic (Medicago litoralis) with carrots deters CRF. Medic interferes with the host-plant finding and the oviposition behavior of CRF (Miles, C.; et al., 1996). Apply properly decomposed organic matter to prevent forked root development. Excess nitrogen (N) may cause splitting or forked roots and may promote foliage growth at the expense of root growth. Apply fertilizer at least 7 days before sowing, as the crop is susceptible to salt injury. 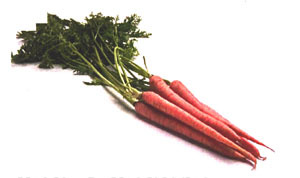 Carrots respond well to NPK, boron, lime, and magnesium. Apply nitrogen and potassium before root enlargement, about 30 days after germination (IFA, 2003). However, fertilizer recommendations based on soil analyses provide the very best chance of getting the right amount of fertilizer without over or under fertilizing. Ask for assistance from a local agriculturist office for soil sampling and soil analysis procedures. Bat guano taken from caves can be directly applied to the soil or made into tea as foliar spray. Till in 2 kg/100 sq feet or 3 tsp per gallon of water. This stimulates soil microorganisms to develop. If you have access to fresh seaweeds, use them but rinse to remove the salt, then apply them as mulch. Apply œ-1kg /100 sq feet area. Seaweeds are long-term soil conditioners and growth regulators. These contain acids and enzymes that promote stronger growth and increase yield (Ellis; Bradley, 1996: p. 412). Carrot will continue to be an important vegetable worldwide, but adaptation to hot climates will remain limited. Resistance to important diseases and pests is becoming an increasingly important aspect of carrot breeding. CABI. (2000): Crop protection compendium. Global module, 2nd edition. CABI Publishing, Wallingford, UK. CABI. (2004): Crop protection compendium. 2004 Edition. CAB International Publishing. Wallingford, UK. CABI. (2001): Crop protection compendium. Global module, 3rd edition. CAB International Publishing. Wallingford, UK. Ellis, B.; Bradley, F. (1996): The organic gardener's handbook of natural insect and disease control. Rodale Press. Emmaus, Pennsylvania. Miles, C.; et al. (1996): On-farm research  Medic and carrot rust fly control. Washington Tilth Conference, Nov 9-10, 1996. Leavenworth, Washington. Muehleisen, et al. (2003): Managing carrot rust fly. Agrichemical and Environmental News. Issue No.23. Wagner, Georg. (2004): Vegetables' pests. Personal Communication. Schopperplatz 14, 4082 Aschach / Donau.